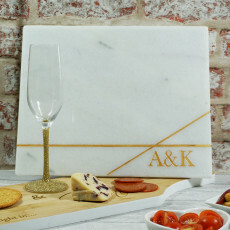 A wonderful marble gift, perfect for any cheese lover! 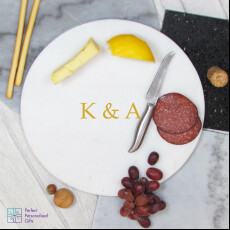 This stunning contemporary wreath design marble cheese board makes a beautiful gift, especially for special occasions such as Christmas, Weddings or special anniversaries. 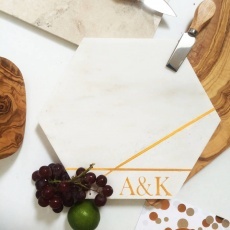 This beautiful Marble Cheese Board Swirl Design is engraved and hand-finished in gold to make it truly stunning. This simple wreath design gives a timeless feel, ensuring the board will stay contemporary and unique for a lifetime. This wonderful piece of marble can be personalised with any two initials which will appear like the image above in the middle of the marble surrounded by the wreath design. Make your marble board even more special and a black gift box, finished with a black satin ribbon to make this a truly beautiful gift. The cheeseboard is food safe and dishwasher friendly. Please include ‘&’ in your personalisation if it is required.